New Sides and Sauces: Felix Classical mashed Potato Mix, Tørsleff Mad Kulør, Knorr Bearnaise Sauce and Café de Paris. 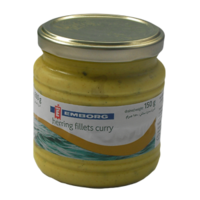 We have also imported a range of new Danish RemouladeSauces - which is your favourite? 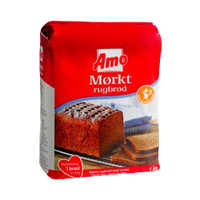 Baking Needs: AMO Dark Rye Bread Mix and Wholemeal Bread Mix. 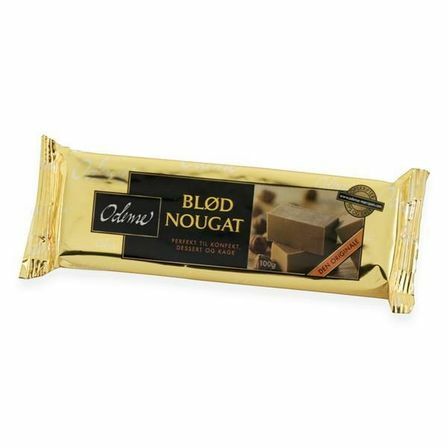 Odense Almond Paste and Nougat. Unfortunately the 250g Nougat was damaged during shipping but the 100g is in perfect condition. We also have Waffle Mix and Raspberry Custard Creme Mix - the taste of summer! 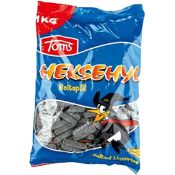 Bread and Crisp bread: Falu Rågrut is back in stock. New Gluten Free Crispbreads from Semper. And for all you Norwegians out there, finally we have managed to source: Vestlands Lefser. Cheese - Soft spread Cheese with: Crayfish, Ham, Shrimp and Reindeer meat. Coffee: New flavour Brazil blend - slightly sweet and with low acidity. Drinks: Low alcoholic Herrljunga Cider, Pear or Apple Flavour. Swedish Cider - Safe to drink when driving - only 0.7% - and still have that nice festive flavour! 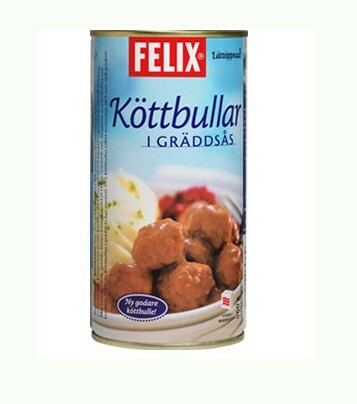 Tinned Food: Meatballs in Creme Sauce, Sibylla Sausages - 2 classical Favourites. Drink Essences: Drinkit's Julmust Essence for Soda Stream - Mix with Soda Water for your very own julmust. Essence for Snaps: Danish Bitter, Skane Aquavit and Jubel Aquavit. Liquorice: Heede Spejderhagl - 1kg hard liquorice. 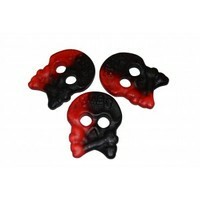 Heksehyl, Salte Sild, Skolekridt, Haribo Salte Bomber,Toms Liquorice Boats, Raspberry Skulls, Salty Skulls, JätteSalt, Lakrisal, Pingvin Stang: Heksehyl, Salty Raspberry, Sweet liquorice. Unfortunately while loading the truck for delivery the pallet broke and the majority of our Perstorp Vinegar Bottles got smashed. This resulted in some other items having their packaging drenched in vinegar, but the content still unharmed. We are selling these items at reduced price, with no outer packaging. Twist Candy Bags - Not damaged by the vinegar accident, but slightly discoloured due to temerature fluctuation during transport. On the last Friday of September Sweden celebrates Jansson Dagen. 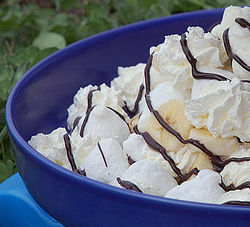 (Janssons Day) – The day for eating Janssons Frestelse! 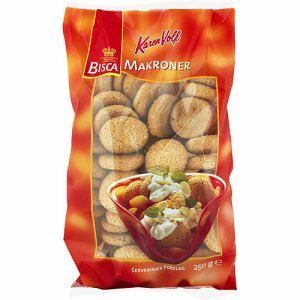 Danish Macaroons are slightly different from Swedish macaroons and Danes normally use these for their lagkage - layered cake. This is the secret ingredient missing in Swedish Layered cake (tårta). 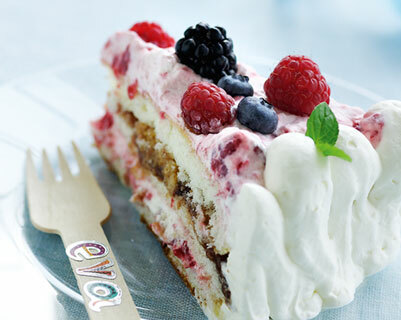 I tried to find a god recipe for Danish layer cake, but there are too many and each recipe look so fantastic I can’t pick one. You’ll have to find your own favourite. As a Swede I have found these macaroons beautiful as they are with my coffee, but also as a great addition to my ‘marängsviss’ (Eton mess).